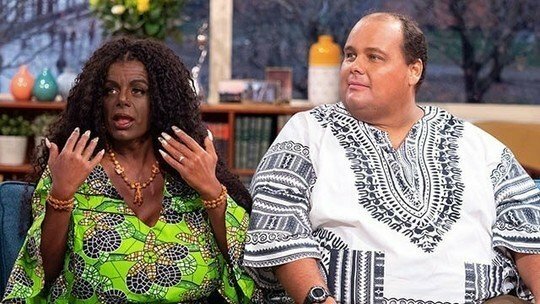 A few years ago, Martina Big was a white, blonde woman from Germany, trying her best to make it as a model. But, as Martina told British TV show This Morning earlier this week, although she liked her “natural blonde beauty,” she also admired the look of the black women with whom she was competing in the industry. In fact, she liked black women so much that she wanted to become one herself. Of couse, changing your race is not scientifically possible – there is no changing who we are. But still, here in 2019, there are a whole bunch of cosmetics experts who are willing to give you the next-best thing – as long as you have the cash. In 2017, Martina started taking injections of a synthetic hormone called Melanotan. According to Cancer Research UK, the hormone increases one’s levels of melanin — the pigment which determines how dark our skin is. Melanotan is currently unapproved by the FDA in the United States, as it has “not been tested for safety, quality or effectiveness.” Despite the ban, many can still access the injections. Martina claims she received three injections of the drug, which changed her skin color dramatically, as you can see from these images. She also says it changed her eye color and made her hair grow in curlier and darker. Martina underwent several surgeries as well, including one to make her lips fuller. You know how they say “there’s someone out there for everyone”? Well, I’m starting to think there might be something to that. Martina married a man named Michael who also wanted to go through the same process she did, and began doing so soon after they met. He joined her in her most recent appearance on popular British TV show This Morning, and Martina told the show that they both followed the same regimen of injections, but that she became much darker than he did. While all of this seems like a lot to take in, that isn’t even the craziest part of the interview. Martina explained to This Morning that a doctor had told her if the couple have a child, the child would also have dark skin. Hold the phone – how is that even possible, given that the couple were both born white? Hosts Holly Willoughby and John Barrowman thought the same thing, and quickly asked how that would be genetically possible. Unsurprisingly, social media users were just as bewildered by the statement. I think it’s fair to say that not everyone is supportive of their identity and lifestyle choice. As for their prediction about the baby… well, I guess we’ll just have to wait and see.